Rental Rate: $180 a Day. Hoverball uses a 1 hp blower to float the balls on a cusion of air, once you hit the ball it falls down into the catch basin, that way you are not chasing balls all over. It is 10 ft wide, 7 feet tall and 3 feet deep (5 feet deep with blower). 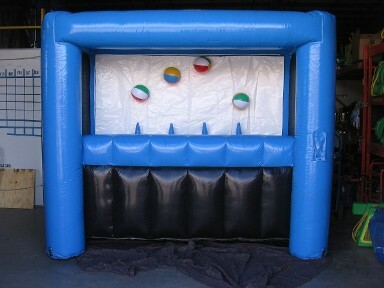 It comes with 12- 10 in inflatable balls and 3 throwing balls.